You can monitor your business banking accounts and approve transactions on your iPhone, iPad or Android device. You can create and authorise payments, view your account information and transaction history, send messages to your advisor and much more. Download our App and access your account from the office, home or abroad. 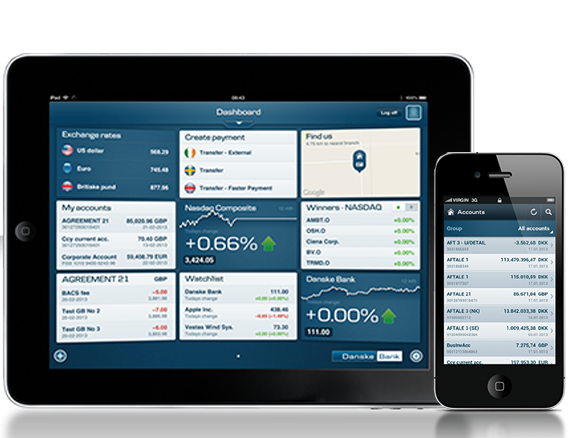 You must be registered for Business eBanking to be able to use Danske Mobile and Tablet Business Apps. Payments made outside the UK are governed by the law that applies where the payment is made. Danske Mobile and Tablet Business Apps are available on Android and iOS devices. Authorise payments and payment files. Transfer money between your own local accounts or to third party local accounts. Get an overview of transactions, payments and balances on your business accounts. View transactions and balance graphs. View balance history and graphs for accounts and groups of accounts. Authorise user changes, block users, remove the blocking of users, delete users and order new user accesses. Authorise changes to payment limits on accounts. View equity, bond and commodity prices. Convert currencies and see exchange rates for more than 25 currencies. Download Mobile/Tablet Business for your smart phone or tablet from the App Store or Google Play. Try out our Mobile and Tablet Business apps by logging onto the demo using user id 8888, password 454545 and security code 454545.
Who can use Danske Mobile/Tablet Business apps? If you have not yet registered for Business eBanking, you can call your local branch or account manager to get signed up. You can call us via the app without having to log on. Can I use the apps when I am abroad? Yes. Before making any payment when you are abroad you should check that it is permitted by local legislation. Is there a maximum limit for transferring money? For Faster Payments, the payment limit is the sterling equivalent of €60,000 per transaction. If you suspect that someone has intercepted your user ID, password or eSafeID, please contact us immediately on 028 90 311377. What if I have forgotten my log on details or password? You can find your User ID in the covering letter that accompanied your eSafeID device. Otherwise please contact us immediately on 028 90 311377.